The Zipp Vuka Alumina Extensions are an exclusive line of aluminum aerobar extensions, designed to provide the perfect fit for any rider. Available in two different bends to achieve the ideal fit, regardless of rider size or riding position. The Race bend features 52mm of rise, weighing in at 175 grams. Designed using data compiled from thousands of fit sessions with recreational and professional cyclists and triathletes, collected by the world's best fitters. The Race bend places the wrists at a more natural bend to help riders remain in their tuck to optimize aerodynamics. The Evo bend are available with either a 70mm (176g) or 110mm (180g) rise. Designed to deliver aerodynamics by placing hands closer together and nearer to the rider's head to start airflow over the rider sooner. 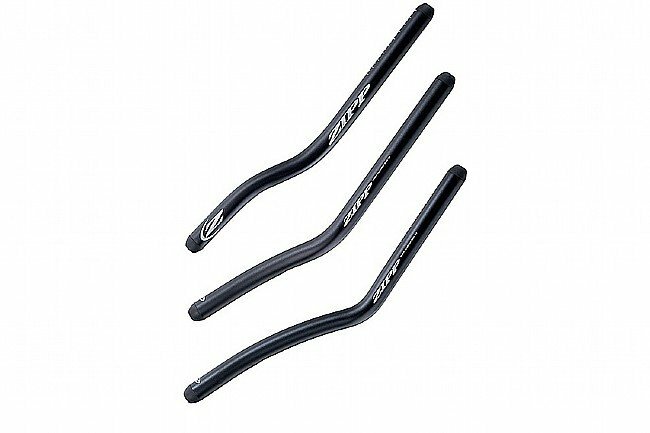 The shape of the Evo bend is crafted to feel as if the rider is shaking hands with the bar. This is achieved through the use of a multi-radius bend paired with a 20mm inward roll of the bar that can be adjusted to dial in fit and achieve an ideal position. Designed with the input from pro's and recreational cyclists alike, delivering the optimal, most functional shapes. Available in two different bends for the optimal aerodynamic fit.